Rabbi Max Weiman lives with his wife and seven children in St. Louis, Missouri where he spreads spiritual ideas through books, tapes, classes, email and the internet. He regularly counsels his readers and students on personal issues. While shying away from an official post with a synagogue, he maintains an informal worldwide congregation. He was ordained by the Chief Rabbi of Jerusalem in 1991. 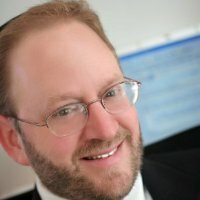 While being an accomplished scholar in Judaism and Kabbalah, he also holds a BFA in Fine Art and a black belt in Tae Kwon Do. His articles have appeared in Today’s Astrologer, the St. Louis Astrological Association Bulletin, Pathfinder, Spirit Seeker, Detroit Jewish Times, NY’s Jewish Press, Denver’s Intermountain Jewish News, and the St. Louis Jewish Light. And on the websites Alternativeapproaches.com, Newagejournal.com, Karmicreport.com, Spiritualminds.com, Womanlinks.com, Cosmicexpress.com, and Aish.com The material on his website KabbalahMadeEasy.com is free and open to the public. It is available for use as content when properly attributed and a link is made available.He is consulted by various media sources as an expert on Kabbalah. He has been interviewed by FoxNews, USAToday, the Riverfront Times and other newspapers. He is available as a speaker to groups of all backgrounds at 314-814-6629. The material in the ten part Beginner Series is on a Kabbalah Yoga DVD. He content edited and provided the foreword to the Everything Kabbalah Book. The Zodiac Group contacted him to arrange a group of Kabbalah Phone Advisors. His own books A Map of the Universe: An Introduction to the Study of Kabbalah, Cycle of Influence: Kabbalah and Astrology, and A Simple Guide to Happiness: From a mystical perspective, he has self-published and is seeking a mainstream publisher for them. Rabbi Weiman believes that spreading the ideas of Kabbalah has the power to change the world. If you have any Questions please feel free E-mail me. For more info on Kabbalah and Astrology, order the book Cycle of Influence: Kabbalah and Astrology from the home page or email him at Mweiman@aish.com. Available in ebook format or spiral bound hard copy.